Boil this talented egg with the fresh ones and it sings at each level of doneness: soft, medium, and hard. It looks, feels, and boils like an egg—but unlike an egg, it sings. 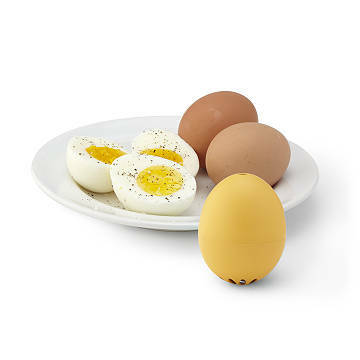 Put this cheerful gadget in the water with fresh eggs and turn up the heat. When you hear the first tune, they're soft boiled. The second means medium-cooked, and the third, hard-boiled. No more watching for the pot to boil or minding a timer, thanks to this crazy musical egg that puts the "fun" in "functional." Made in Germany. 2" H x 1.8" Dia. Dishwasher safe. Not intended for microwave use. Store with eggs for best results. Hard Boiled - Hail, Hail the Gangs All Here"